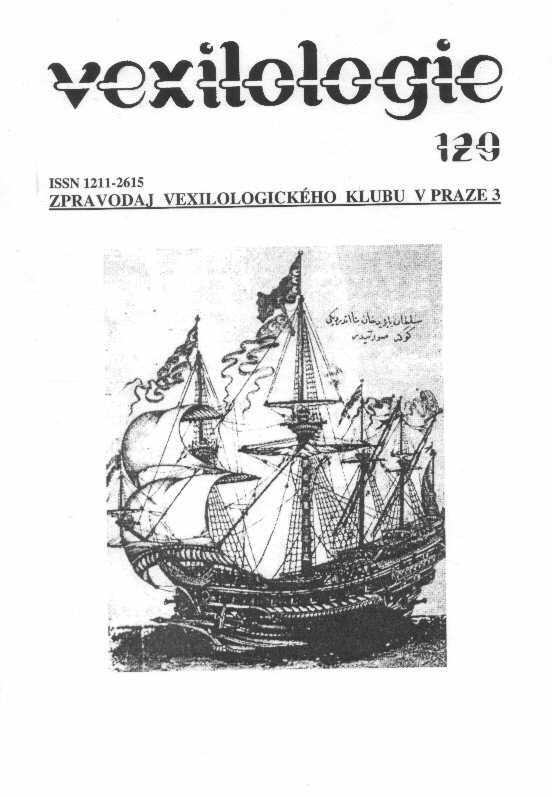 The author Jaroslav Martykán describes the history of Ottoman naval flags since their appearance in the 14th century till the ruin of the Ottoman Empire in 1924. The efforts of the former corsar and then Imperial Admiral Hayrettin Barbarossa to build up a new powerful Navy are mentioned. His naval reform is dated 1518 when naval rank flags were introduced for the first time. Those of sultan and captains are illustrated under Fig. 1 and 2. Other changes in naval flags are linked with the name of another important Ottoman Admiral - Küçük Hüseyin Pasha in 1793. The use of traditional red colour (interrupted by so called "Islamic era" of the Ottoman vexillology between 1730-1793 when red colour was eradicted from Ottoman flags and banners and replaced by green one) was renewed and a new symbol of an eight-pointed star was introduced. The crescent and star were excluded off symbolism of the sole dignitaries or commanders and gained a character of exclusive Imperial, State symbols. New rank flags (those of commodores - Fig. 8) were introduced when the constitution in 1876 came into force. Following the adoption of the second constitution in 1908, the complete symbolism of the supreme maritime commanders were established. Under Fig. 9 and 10 the flag of the Commander-in-Chief of the Armed Forces and that of Pasha - Viceadmiral are illustrated. Generally, they survived to the Republican era, even when they have a square form and a slightly changed arrangement of stars since 1936. 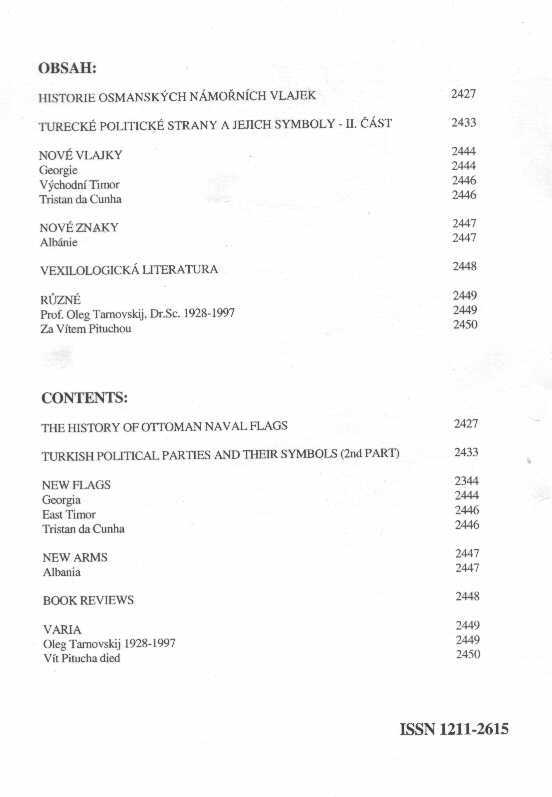 Jaroslav Martykán has recurred to the matter of Turkish political symbols after more than ten years. While some of traditional political parties have restored their old symbols (e.g. True Path Party – Fig. 4) some of them even re-adopted their previous names, too (Republican People’s Party – Fig. 6, Nationalist Action Party – Fig. 10, Democratic Party – Fig. 20). However, many new political parties have appeared on the scene in the meantime. When Islamic Virtue Party was banned on June 22nd 2001, its followers created two new parties immediately. The traditionalist wing established the Felicity Party (Fig. 13) in July 2001 and the Justice and Development Party (Fig. 14) was founded by the reformists led by Recep Erdogan one month later. The latter party gained a sweeping victory in the last year extraordinary elections to the Parliament and expresses moderate approach to solution of the contemporary Turkey’s problems. There are many tiny political parties established within the 1990’s on both sides of the political scale – from the rightmost Great Unity Party (Fig. 11), Enlightened Turkey Party (Fig. 12) and the National Party (Fig. 18) via moderate and democratic the Mainroad Party (Fig. 21), National Unity Party (Fig. 23), the Young Party (Fig. 1), Eurasia Party (Fig. 2) and Patriotic Party (Fig. 25) up to those ones placed on its left edge. Some of them are easy distinguishable according to their symbolism (e.g. the Workers´ Party – Fig. 19 or the Labour Party – Fig. 17), the others have to hide their aims like the Freedom and Solidarity Party (Fig. 22), especially if they struggle for the Kurds rights – People’s Democracy Party (Fig. 15) or Democratic People’s Party (Fig.16). Two moderate leftist parties – Social Democrat People’s Party (Fig. 7) and New Turkey Party (Fig. 9) - were established in 2002 by defectors from then biggest parties in the left, i.e. from the Republican People’s Party and the Democratic Left, respectively. The already presented symbols of two former biggest political parties of Turkey – the Motherland Party and the Democratic Left Party (Fig. 8) remained unchanged or they had been altered slightly only.